Unam Sanctam Catholicam: My God, My God, why hast thou forsaken me? 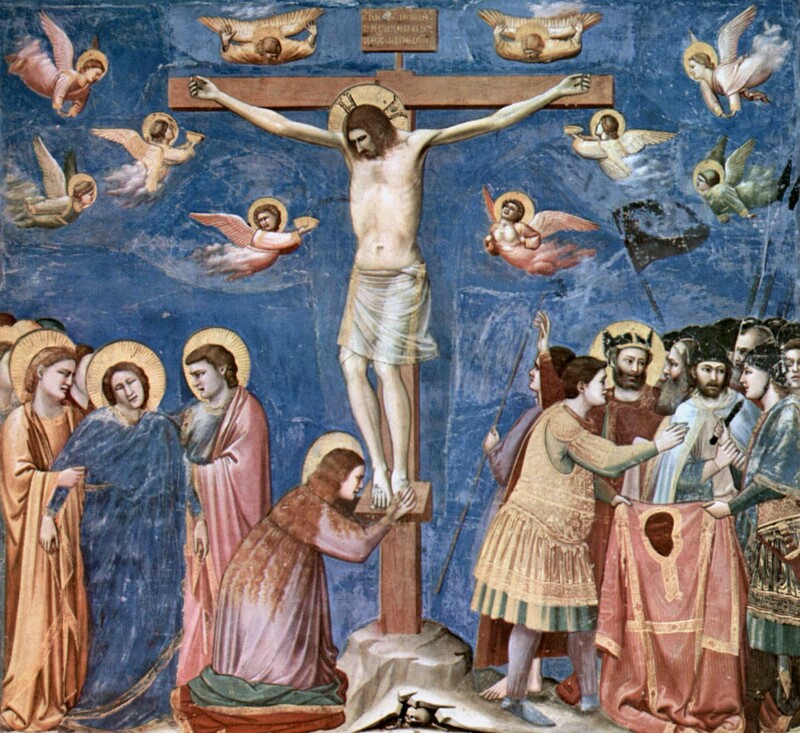 As I have mentioned in previous posts, it is my firm conviction that many, if not most, Catholics, and I include clergy and laymen, theologian or otherwise, hold to some version of the Protestant notion of penal substitution when it comes to the doctrine of the Atonement wrought by Christ. "Christ suffered the full weight of punishment due in justice to all the sins of mankind." What is wrong with that statement, you ask? Think about it. What is the punishment that sin deserves? Death; not just physical death, though, eternal death; specifically, eternal separation from God. At this point, some one will usually appeal to Christ's cry from the Cross, "My God, My God, why hast thou forsaken me?" Doesn't this mean that Christ did experience separation from God, which is exactly what the punishment of Hell is? In short, No. The pain suffered by a separated soul belongs to a state of future damnation which exceeds every evil in this life, as the glory of the saints exceeds every good of our present existence. When we speak of Christ's pain as being maximal, we exclude all comparisons with the pain endured by a soul in the next life. (ST, III, 46, 6, ad 3). While the immediate knowledge of God, which is absolutely supernatural, is vouchsafed to other men only in the next world (in statu termini), Christ's soul possessed it in this world (in statu viae), and indeed, from the very moment of its union with the Divine Person of the Word, that is, from the Conception. Christ was therefore, as the Schoolmen say, viator simul et comprehensor, that is, at the same time a pilgrim on earth and at the destination of His earthly pilgrimage. It follows from this that He could not possess the theological virtues of faith and hope. Pope Pius XII, in the Encyclical "Mystici Corporis" (1943) declared: "Also that knowledge which is called vision, He possesses in such fulness that in breadth and clarity it far exceeds the Beatific Vision of all the saints in Heaven" ... "in virtue of the Beatific Vision which he enjoyed from the time when He was received into the womb of the mother of God, He has forever and continuously had present to Him all the members of His mystical Body and embraced them with His saving love" (D 2289). (Ludwig Ott, Fundamentals of Catholic Dogma, 162-63). Objection 1: It would seem that the Godhead was separated from the flesh when Christ died. For as Matthew relates (27:46), when our Lord was hanging upon the cross He cried out: "My God, My God, why hast Thou forsaken Me?" which words Ambrose, commenting on Lk. 23:46, explains as follows: "The man cried out when about to expire by being severed from the Godhead; for since the Godhead is immune from death, assuredly death could not be there, except life departed, for the Godhead is life." And so it seems that when Christ died, the Godhead was separated from His flesh. Reply to Objection 1: Such forsaking is not to be referred to the dissolving of the personal union, but to this, that God the Father gave Him up to the Passion: hence there "to forsake" means simply not to protect from persecutors. or else He says there that He is forsaken, with reference to the prayer He had made: "Father, if it be possible, let this chalice pass away from Me," as Augustine explains it (De Gratia Novi Test.). (ST, III, 50, 2). Objection 1: It would seem that there was sin in Christ. For it is written (Ps. 21:2): "O God, My God . . . why hast Thou forsaken Me? Far from My salvation are the words of My sins." Now these words are said in the person of Christ Himself, as appears from His having uttered them on the cross. Therefore it would seem that in Christ there were sins. Reply to Objection 1: As Damascene says (De Fide Orth. iii, 25), things are said of Christ, first, with reference to His natural and hypostatic property, as when it is said that God became man, and that He suffered for us; secondly, with reference to His personal and relative property, when things are said of Him in our person which nowise belong to Him of Himself. Hence, in the seven rules of Tichonius which Augustine quotes in De Doctr. Christ. iii, 31, the first regards "Our Lord and His Body," since "Christ and His Church are taken as one person." And thus Christ, speaking in the person of His members, says (Ps. 21:2): "The words of My sins" - not that there were any sins in the Head. (ST, III, 15, 1). I answer that, As observed above, Christ suffered voluntarily out of obedience to the Father. Hence in three respects God the Father did deliver up Christ to the Passion. In the first way, because by His eternal will He preordained Christ's Passion for the deliverance of the human race, according to the words of Isaias (53:6): "The Lord hath laid on Him the iniquities of us all"; and again (Is. 53:10): "The Lord was pleased to bruise Him in infirmity." Secondly, inasmuch as, by the infusion of charity, He inspired Him with the will to suffer for us; hence we read in the same passage: "He was offered because it was His own will" (Is. 53:7). Thirdly, by not shielding Him from the Passion, but abandoning Him to His persecutors: thus we read (Mat. 27:46) that Christ, while hanging upon the cross, cried out: "My God, My God, why hast Thou forsaken Me?" because, to wit, He left Him to the power of His persecutors, as Augustine says (Ep. cxl). (ST, III, 47, 3). In his most compassionate humanity and through his servant form we may now learn what is to be despised in this life and what is to be hoped for in eternity. In that very passion in which his proud enemies seemed most triumphant, he took on the speech of our infirmity, in which "our sinful nature was crucified with him" that the body of sin might be destroyed, and said: "My God, my God, why have you forsaken me?" ... Thus the Psalm begins, which was sung so long ago, in prophecy of his passion and the revelation of the grace which he brought to raise up his faithful and set them free (Letters, 140 to Honoratus 5). See this article for more on Christ's cry from the Cross. Very thorough treatment, we also see this in the garden when he prayed that His Father would let this cup pass. Very nice post, yet I always thought that another reason Jesus said what he did was to point out the fact that His crucifixion and death were foretold. He was quoting the 22nd Psalm to direct the priests and pharisees that He was THE Chosen One foretold from long ago. The casting of lots for his garments; how his joints were dislocated upon the cross; how people surrounded him telling Him to come down from the cross if He were truly the Son of God, etc. Love your blog by the way. I always understood it as grocery dude understood it.